It is with great sadness that I convey Doris Crenshaw's message that Bob had passed away of a massive heart attack this morning. His passing is a major loss to SNCC and the legacy he created in Lowndes County. Others may get more details as they become available. The SNCC Legacy Project mourns the death today of former SNCC Field Secretary Robert C. Mants, Jr. (1943-2011). Bob suffered a massive heart attack Tuesday, December 7, 2011 in Atlanta, Georgia. Born and raised in East Point, Georgia, Bob was a 1961 graduate of East Point/South Fulton High School. While still in high school, Bob was the youngest member of the Committee On Appeal for Human Rights (The Atlanta Student Movement) at the age of 16 and in the 11th grade while at the same time volunteering at the Student Non-Violent Coordinating Committee Headquarters. He attended Morehouse College. By the summer of 1964 Bob was working for SNCC in Americus, Georgia. He met his future wife, Joann Christian, while working with the SNCC Southwest Georgia Project. In early 1965 he went to work in Lowndes County, Alabama, and was instrumental in the planning of the Selma-to- Montgomery March in March 1965. On "Bloody Sunday" Bob was in the front ranks of marchers as they crossed the Edmund Pettus Bridge in Selma. 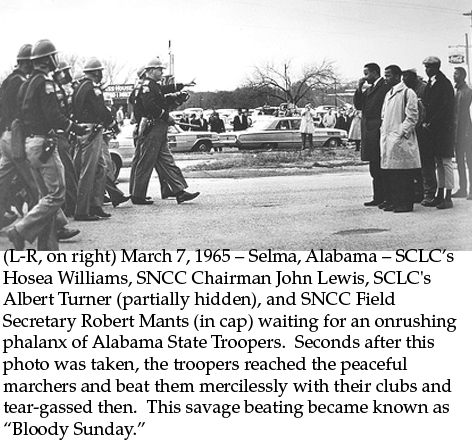 At the 25th Anniversary of "Bloody Sunday" Bob told the New York Times: "Two months after Bloody Sunday, an organization I was in got to work in nearby Lowndes County, which was 81 percent black and had fewer than 30 black registered voters and no black elected officials." 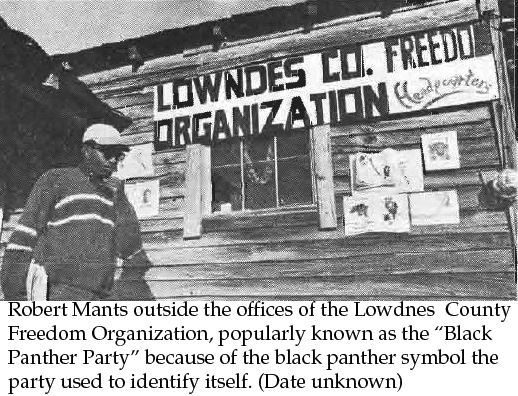 The result was the Lowndes County Freedom Organization (LCFO), whose symbol, a black panther, would be adopted by the Movement of that name. Bob Mants continued to live and work in Lowndes County until his untimely death. He served as a Lowndes County Commissioner for many years, and was chairman of the nonprofit "Lowndes County Friends of the Historic Trail." Robert Mants is survived by his wife of 45 years Joann Christian Mants, a high school teacher in Selma, Alabana; three children: Kadisha, Kumasi, and Katanga; and seven grandchildren. Read more about Bob Mants: Visit the SNCC Legacy Project website at: www.SNCCLegacyProject.org. Excerpt From On the Road to Freedom, a Guided Tour of the Civil Rights Trail by Charles Cobb Jr. The civil rights marchers who walked from Selma to Montgomery in 1965 camped on various Black-owned farms, and signs along Highway 80 point them out. But it's not Selma that defines this trail, it's Lowndes County. Forty-three miles of the 54-miles of what the National Park Service now designates a "freedom trail," passes through Lowndes County. The county is as rural now as it was forty years ago. It also remains one of Alabama's poorest. There are still people living without sewers or septic tanks; a third of the county's 13,500 residents live in mobile homes. One of the important figures in the county's civil rights movement is Bob Mants, an Atlanta native who dropped out of Morehouse College, joined SNCC and worked in Americus Georgia before coming to Alabama. He came with John Lewis and was with Lewis on the bridge on Selma's Bloody Sunday. Bob puts on one of the several hats he wears today — this one, Chair of the "Friends of the Trail," to talk to me for a while. The Friends organization, he points out, has been around for 16 years. "We began doing this long before the Park Service's Selma-to-Montgomery trail. In our conversation Bob elaborated on his ideas for local tourism. It's not just about civil rights movement history, he says. "Everything is here for tourists from civil rights history to Civil War history to wonderful bird watching. "People who just think of Selma and Montgomery need to know there is a long, rich history here, going back to Native Americans, Hernando Desoto who passed through the area, and Jesse James who hid out here for a while. Booker T. Washington helped establish the county's first Black public school. The Southern Tenant Farmers Union was active here in the 1930s and the civil rights movement during the 1960s, of course. This is where the Black Panther Party in Oakland got their panther and the idea for their party — Eldridge [Cleaver] was out here working on an article about our panther party for the old Ramparts magazine. "History could very well be our economic lifeline." The civil rights history projected by the Park Service skips over Lowndes County, Bob feels; or as he puts it, "does not capture the true flavor of Lowndes County's civil rights legacy." From the campgrounds that civil rights marchers once used, Bob Mants envisions historic tours, hiking and exercise trails, and produce markets for area farmers. He wants to rehab sites of historic importance like the old Hayneville jailhouse, the old SNCC "freedom house" (625 Freedom Road in White Hall) where civil rights workers stayed.' And bring attention to churches like First Baptist Church in Hayneville, "where people voted for the first time under the black panther emblem;" and Gillard Church in White Hall — an important base of civil rights support — even do something with the County Courthouse. And he is looking for money for a museum he envisions, a permanent local museum — "a Freedom Folks Museum" reflecting "those who bore the burden in the heat of the day" like those who spent two years in the tent city on Highway 80. He's prepared to help get it started with his own extensive collection of material — leaflets, photographs, "even my W2s from SNCC." Bob never left the county and has no plans to retire and move somewhere else. "This is a lifelong mission for me," he says. "The work didn't stop with the civil rights movement and I'll be doing it until the day I die. It's part of the whole unfinished question of justice." Bob Mants lived on Chestnut Street in Atlanta, two blocks from the Atlanta University Center and joined the Atlanta student movement as a high school student. His mother was a constant beneficial prod to students walking by. He will be sorely, sorely missed. What a loss. Many of us remember Mrs. Mants well. Bob was like a cornerstone to a building. Mortality is slapping us in our faces. Many of us spent time with Joann Mants, her children and grandchildren at the Smithsonian earlier this year. Awww man! We are moving on fast. Not much time to give each other a lot of love. No time for tears, just love and memories of who we are. We are one great family of people who did great things as a family. We will miss Bob, but as long as we have the memories he will be with us. Unbelievable. Literally. What a vital man and brother. I saw Bob a few years ago down in Alabama. His immense contributions have yet to be fully documented. And another SNCCer who raised goats. just talked with donald stone who lives near whitehall, ala, bob's home. don talked with bob's youngest daughter, katanga, who said that he was found slumped over the wheel of his truck in a mall lot in atlanta. the cause of death was heart failure. the police have yet to release the body and the family has made no arrangements. i feel blessed that i got to hang out with bob this summer at his home. for those who knew bob, he always had some project he was working on and was never still. there are few people i call a hero of mine--bob was definitely one. On top of Ed Brown passing on this makes this month the worst I have experienced in a very long time. Over the years since the SNCC days Bob helped me in myriad ways as I struggle go gaiin focus for writing about the movement. One of my earliest poems, was written to accompany a great photo of Bob (see SNCC Legacy Project statement above). He was contributing to Movement until he passed. His spirit and our memory of him still does. Mr. Brooks (Owen) said that Bob left a voice message on his home phone yesterday to talk about Ed Brown and the upcoming memorial and the passing of Mr. Brown. Of course the Mississippi veterans that we are contacting by phone are in shock but they all have wonderful memories. Yes, sad news. If any of you get to Lowndes County, there is a Department of Interior operated museum on the Selma-Montgomery Highway (whose highway number I can't recall at the moment) that has a full scale recreation of a part of the Lowndes County tent-city, and a pretty good presentation of SNCC's role in Lowndes. Bob had a lot to do with that. His contributions and achievements to the Movement have yet to be properly assessed. This is very sad news, indeed. Pat and I both are mourning Bob's passing. He called us just last night, saying we should get together to see what we could do for youth. One of my favorite memories of my movement days and of Bob was this episode, which to me illustrates Bob's wit and creativity. We worked together in Americus, one of the toughest towns in Georgia in its resistance to the movement. There was a crazy white guy named Linton Slappey who liked to hang out with the Americus police. They used to encourage him to harrass us by calling us very early in the morning and greeting us with a torrent of cursing. Bob and I took turns answering those calls, knowing who it must be. One morning Bob took the call, waited for Slappey to run out of curse words, and asked him if he was calling from the police station, which we had suspected. Bob said, "I want to talk to you. Wait while I get a cigarette." Bob then said to me, "Let's go to the station." We drove the short distance there and saw Slappey, leaning on the front desk, just inside the front door, holding the phone! We honked and waved at him, whereupon Slappey threw down the phone, stomped on the floor, cracked his knuckles and snorted, launching into another streak of blue language, his usual response to catching sight of us. Bob and I laughed and went home. Bob's passing is a great loss to us all. Betty Fikes called me on early yesterday afternoon to tell me about the passing of our beloved brother, Bob. I was stunned and then called Mukasa (Willie Ricks). By this time I was distraught and Mukasa cheered me up. Bob and I were very close, even during his moody days — sometimes he would not speak to me (and I would ask if he were in his "habit"), but he always kissed me on the cheek even if he had not said a single word to me. For many years, Bob would visit me in my home, at the archives and would call me every morning at about 5:30 AM. We worked together in making the Selma-to-Montgomery Voting Rights Trek become a National Historic Trail with emphases on the Lowndes County portion of the Trail, Tent Center and the people of Lowndes County, thus, the first interpretative center was ereected in Lowndes County. Brother Bob had a beautiful penmanship, and I told him that it was like caligraphy. He responded with his sheepish smile and said, "Yeah, I stayed up all night in the SNCC office, making picket signs." And, of course, Brother Bob was a mentor to our Tuskegee Student Movement. He practically moved into the dorms and assumed matriculating student status. I will deeply miss my Brother Bob, as I called him. We have a small (contemporary period) vertical file on Brother Bob in our archives. Brother Bob did create a Mants Family Collection and designed an outstanding exhibit on SNCC in Lowndes County. I saw him at one of his happiest moments this past March 2010 when he organized a wonderful book signing event with SNCC sisters whose experiences are chronicled in Hands on the Freedom Plow. He beamed with joy as his wife-soul-mate, JoAnn Christian Mants, shared her Movement experiences with the overflow crowd at the Lowndes County Voting Rights Interpretative Center. Brother Bob had pre-sold over 250 books! Please google www.montgomeryadvertiser.com, 12/8/11. page. 1C. Alvin Benn, the journalist, was a close friend to Brother Bob; they shared their same day birthdays together. Brother Bob is now dancing with our comrades and ancestors of struggle. I know he is smiling upon his and with his wry wit admonishing us to continue the struggle. Unfortunately, I never got to meet Bob. I was in Mississippi. But we always kept track of the fine work done in Lowndes Couty, AL in the project I was involved in. People from our movement are passing on. We will always remember them. Yesterday I received the news of the death of my friend and colleague Bob Mants. I was on the phone with Bob Thanksgiving last when he informed me of the passing of our other SNCC brother Ed Brown. Before leaving Washington for Thanksgiving in Newnan with my mother, Bob, Frank Holloway and I had previously made plans to go by to see Ed on Black Friday. Before we could do so Bob called with word that Ed had already transitioned. So, you can imagine how shocked and sad I was to get word of his passing. I have known Bob since my early days with SNCC at Morehouse which is now more than fifty years. I met Bob when I enrolled as a freshman at Morehouse college in 1959. Bob was self motivated with a sharp mind and a passion for freedom. At the time he was too young participate in the demonstrations but he was already hanging around the college campus, cleaning up the movement office of the Atlanta Committee on Appeal for Human Rights and telling all the pretty girls he was in college although he was still at the time a senior at Booker T. Washington High School. He wanted to be in the movement, to picket, march and go to jail but he was too young so he hung around the office cleaning up and waiting his time. His time would soon come. In time he would enroll at Morehouse, march, picket, go to jail and celebrate victories in Atlanta before we would both make the decision to leave college and become full-time organizers for SNCC. I would go to Mississippi and Bob to Alabama. The image of Bob Mants, Hosea Williams and Cong. John Lewis leading the Selma to Montgomery March on Bloody Sunday will be forever seared into the minds of freedom loving people everywhere. The Selma march and the MFDP challenge at the Atlantic City Democratic convention led to the passage of the 1965 Voting Rights Act which revotulionized the country, led to Fair Housing Act, the Equal Employment Opportunity Commission and the election of Barack Obama as the 44th President of the US. Bobs footprints on the bridge in Selma established his legacy as a freedom fighter and made America a better place. Bob's story and others like it are detailed in the "Civil War to Civil Rights" exhibit at the African American Civil War Musuem in Washington. He is absent in the body but present with the Angels of Freedom. Words cannot describe the terrible sense of loss I felt when I learned the Bob Mants died. He was a really wonderful guy, an incredibly hard wroker and bave beyond description. In my humble opinion Bob was a "poster boy" for what we wanted our Movement heroes to be. Only a few months ago when we were in Albany celebrating the 50th Anniversary of the Albany Movement I got to spend a little time with Bob. He was married to one of my favotite people from Albany, Joann Christian Mants. I have written about my experience wtih her on the first day I got to Albany in the summer of 1963. I think she must have been 14 of 15 and brave beyond belief. It still brings tears to my eyes when I remember telling her that I would deal with the Sheriff removing her [jail cell] light bulb because she was singing Movement songs (like I really could have done something — write it up to "Naive White Boy in the South". But she said, "It's o.k., Jesus is my light." OMG. So my heart goes out to Joann and I will remember Bob forever. My heart is heavy with the news of the passing of our comrade, Bob Mants. What a shock? I must admit I shed some tears. I have such fond memories of Bob and great admiration for this comrade who never left the Movement. He gave his ALL to the struggle for justice and human rights. It was my great pleasure to meet some of Bob & Joann's children in Washington, D.C. at the /Hands on the Freedom Plow /day long seminar at the Smithsonian. I am so glad that I got to meet them there and to share the podium with Joann, Bob's comrade and stalwart companion for all these years. (Joann you and the children are in my heart and in my prayers!) I am happy that I saw Bob at the SNCC 50th Reunion and teased him about not aging, as he still looked so much like that young man at met in the 60s. Bob has joined the Elders now but his work and his memories live on in all of our hearts and memories and his genes live on in his children! Alhamdulilah! I salute his work, his commitment to justice and his indominitable spirit! Presente' Bob Mants! Your Work Lives On! Bob stayed true to the cause of freedom and justice and was on the case till the very end. Long live the memory of Bob Mants! Bob, Cleo, Stokely were the pioneers and founders of the Black Panther Party in Lowndes County. Bob was a true believer. He went to Lawndes County to organize and stayed. He continued to organize in that county until his death. A wonderful man...I will miss him. Bob Mants had something contagious. He possessed a physical bravery that was sometimes breathtaking. He is known for that. But his bravery is not all I am talking about. Crazyhorse was brave beyond all measure battling with encroaching Europeans seeking to take lands belonging to the Sioux and other tribes. Crazyhorse became know for that. That great Native American leader is famous and honored as a leader of his people, however, not just for his bravery in battle, but as a thinker with wisdom and the knowledge of how to achieve his people's goals. Crazyhorse, quiet and humble, dreamed of uniting and mobilizing the great Teton Circle of the Sioux Nation. Mants, determined to unite his rural community behind the Black Panther, taught that the combined power of grassroots people could throw off the boot of Southern and American racism. Courage, combined with both wisdom and humility, is what Bob Mants has. Mants, which is what SNCC people called Bob, had both physical courage and the vision required of a great leader. Endowed by his Creator with the magnetic personality along with a philosophically strong sense of his own personhood, he earned his knowledge and education through hard work and determination. The vision part of his makeup, however, I believe, he caught from SNCC. That, to me, is the contagious part of the puzzle that was Bob Mants. Bob Mants and Bob Moses shared quietness and a reluctance to stand in the stage lights; that became a powerful leadership tool. Perhaps they acquired such power from our great mentor, Ms Ella J. Baker, the quiet woman who sat by the door. Bob Mants also learned leadership through his experience in and study of Africa. Ms Baker seldom spoke except to "sum up" or condense the sense of the group. Like elders in Native American culture and that of Africa, her power lay not in convincing others of her point of view, but by shining a light on what everyone already agreed to or knew. She often knew we had reached consensus before we did. Ella Baker wasn't shy about firm leadership when necessary, however, as evidenced by her opinion there was no contradiction between direct action and voter registration. Voter registration and political organizing in Mississippi and Alabama, as Mants understood, was direct action. Bob Mants was infected by his people's and the people's passion for justice. He passed it to fellow freedom sisters and brothers. As Michael (Wright) Oshoosi said in his remembrance, "Bob was a steadfast organizer and his demeanor gave people courage..."
SNCC organizers exhibited steadiness in extreme situations because most had decided some things were more important than long life. When one prepares to die for the common good, that person attains immense power. Among my many personal memories of Bob is his willingness to correct people when they are wrong. His quiet demeanor masked a remarkable intellect and a firm pride. We were together at a symposium at Brown University and I was being unusually bombastic, as I can sometimes be. Having been in the North for some time, and having trouble being heard in fast talking Yankee circles, I had unconsciously developed a habit of interrupting people. It seemed necessary if one had anything to say. Mants took exception to my interruptions, needless to say, and told me in no uncertain terms to please wait until he had finished what he had to say before responding. Thank you, my brother. Power to Mants, the ancestors with whom he dwells, and power to the people for whom he fought! My deepest condolences go to all of Bob's extended family. I loved Bob and I did not tell him the last time I saw him. As remembered by Avon Rollins, Sr.
My wife, Sheryl and I, want to express our deepest sympathy in your loss of a great man and super hero of so many that knew Robert "Bob" Mants. Bob along with the other SNCC super heroes made the South and America a better place to live. Bob Mants shook the tree of democracy so profusely that fruit fell for future generations of black children to enjoy a better life. Bob was not the one to jump out front to take the credit. Bob Mants truly helped to make the 1964 and 1965 Civil Rights laws possible. I have great memories of being in the struggle with Bob and of our fifty year friendship. As long as the SNCC family has memories, Bob Mants will be remembered and it is important to transfer our memories to the next generation. The struggle continues as we say farewell to a great man, a great friend, and a SNCC family member. I can not be with you and your family personally because of my family's health issues. However, my thoughts and prayers are with you and may God continue to be a blessing in your life. If I can be of help, I am just a telephone call away. Bob Mants was born and raised in Atlanta, Georgia. He joined the Civil Rights Movement when he was 19. He moved to Alabama and that's where he has been ever since. He was part of an organization called S.N.C.C. (Student Nonviolent Coordinating Committee) in the 1960s. In 1965 Bob was in the freedom march from Selma, Alabama to Montgomery, Alabama. It was a very famous march. Bob got beaten very badly and the man next to him got his head cracked open by policemen on horseback while they were marching. Bob Mants helped to make SNCC as good as it was. SNCC was a civil rights movement for black people. He would go to people's houses and ask them to be a volunteer of SNCC or ask them to come to marches which usually meant going to jail. Bob Mants was only one of the people of SNCC, but I think he is the best person to represent SNCC, even though he wasn't one of the stars. I met Bob at a SNCC reunion that my mom went to. He was great. And he had a lot of frightening and funny stories to tell, for example the time that he got beaten up. Bob worked very hard, trying to get black people to register to vote or to go on demonstrations. He also didn't used to make that many speeches, but when I met him he gave a very good speech that everyone thought was so fantastic and so funny that either everyone was nodding their heads in agreement or laughing so hard that they cried. He helped black people stand up for their rights and get better jobs. Now Bob has a better job than he used to. He is a county commissioner in Lowndes County, Alabama. It is really amazing that Bob is the county commissioner in Lowndes County because that county was one of the hardest places for black people to win their rights. The reason he is a county commissioner is because now black people can vote and a little while ago they couldn't. Also, Bob is married to a woman who was a civil rights leader in her town when she was only 14. Bob felt very strongly about the movement (as people called it) because he is a southerner and because he is a black person. He helped make black people freer than they were then, and he helped pave the way of other organizations of civil rights. I respect Bob because he made America a better nation by what he did. Bob Mants is a very courageous and energetic person and I think he deserves to be in the hall of fame. I first met Bob Mants when he came to Americus, Georgia to help the Americus-Sumter County Movement organize around registering African Americans to vote. I was a high school student and had been working in the Movement two years prior to his arrival. We bonded instantly and became the closest of friends. I had never met someone so young, yet so passionate and committed to working to empower his people. Although only two years older, he became my mentor, clearing unknown paths for me, correcting my sometimes erratic and compromising actions, but always with a calm sense of caring. When in Atlanta, he always found time to call and recently invited me to a country fish fry at the family farm here. We had the opportunity to visit with his closest friend, Ed Brown before he transitioned. Bob visited him frequently and I believe Ed was truly his best friend. I have to believe that Ed's passing had a profound impact on Bob. He loved the man and his death affected him deeply. I loved big brother Bob...and he will be missed.